Want to streamline your feeding program? A “complete feed” might be the way to go. These feeds, available from most reputable feed manufacturers, have both grain and roughage in them and are designed to at least partially replace the forage (hay and/or pasture) in your horse’s diet. They provide concentrated nutrition, but because they compress all that feed into a more convenient format, they have to be fed carefully. Read the feeding directions carefully and never exceed the amounts listed on the bag or label (adult horses should consume no more than 1.5 to 3.0 percent of their bodyweight in total daily feed). Unless there’s a really good reason to totally eliminate hay from your horse’s diet (such as a severe case of heaves or very poor teeth), continue to feed a small amount of long-stemmed hay along with the complete feed. Dr. Martin Adams, of Southern States Cooperatives, recommends about half a percent of your horse’s body weight per day in hay as a rule of thumb when you’re feeding a “complete” ration. Check the package directions for more guidelines, which may vary depending on the fiber content of the feed. Feed hay before the complete feed to allow your horse to partially satisfy his hunger. This will make him less likely to gobble his pelleted or textured ration. Make sure fresh water is available to him along with the hay. A horse that drinks while he’s eating long-stemmed fiber will experience gut fill, which will also slow down his appetite. If you can’t feed your horse long-stemmed hay, consider feeding him soaked hay cubes or roughage chunks before the complete feed. In such products the hay is chopped into short pieces, but it will still help fill him up to some degree. Feed small amounts of the complete feed spread out over three or four meals a day, rather than offering only one or two large meals. This will enable your horse to digest the feed more thoroughly as well as cut down on the boredom factor. If your horse tends to inhale his feed like he never expects to see another meal, slow him down by placing a couple of large, smooth rocks in his feed tub. Or choose a complete feed made of small pellets, and serve them in a shallow, wide feed tub placed on the stall floor. That way, your horse will have to work to pick up all the pellets. Karen Briggs is a freelance journalist, equine nutritionist and the author of Understanding Equine Nutrition. I like complete feeds because it is hard to find good hay and when you do, you have to pay through the nose for it. Thankyou for this article on complete feeds you have just answered several concerns that I have had about using a complete feed. I now know how to slow them down when eating and realize that it is safe to use complete feeds if done in the correct way. I just read an article by Briggs, stating that hydrolized collages does NOT work in horses – this is not true. A German study (details here:http://www.askthevetblog.com/home/2008/10/9/dr-grays-featured-article-horses-absorb-components-of-gelati.html) suggests that gelatin can repair cartilage, therefore can be beneficial for hoof health also. 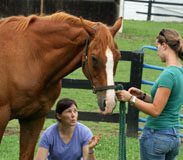 There are so many “equine nutritionists” these days, that it is difficult to find someone accurate, and no opinionated.